The Mercury transit, depicted conceptually here, will occur between about 7:12 a.m. and 2:42 p.m. on May 9. 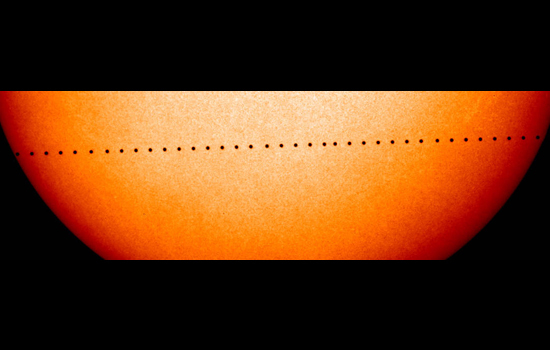 The Rochester Institute of Technology Observatory will host a daytime open house to watch the planet Mercury pass in front of the sun. The observatory, located at 645 John St., will be open to the RIT community and the public from 8 a.m. to 2:30 p.m. on May 9 to coincide with Mercury’s seven-hour transit of the sun. The planet will reach the middle of the sun by 10:57 a.m. EST. Visitors to the observatory can view this event safely through telescopes with special filters. The transit of Mercury happens about 13 times a century, and last occurred in 2006, according to a NASA news release. Astronomers searching for planets outside of our solar system look for similar events in other stellar systems, when orbiting bodies transit or cross in front of a star and dim its brightness for a few hours. Scientists can determine the planet’s size and orbit, estimate its temperature and gain clues to the planet’s ability to support life.